Easy Peanut Ladoo Recipe / Peanut Jaggery Laddu / Peanut coconut laddo is a healthy delish that can be made very quickly with just 5 ingredients. You can make this ladoo for kids as after school snacks or during festival occasions like diwali or any occasions. I used dry roasted peanuts, if you have raw peanuts, dry roast it before making ladoo. Every bite of ladoo is very soft and scrumptious. My husband loves peanuts, so I made it for him. 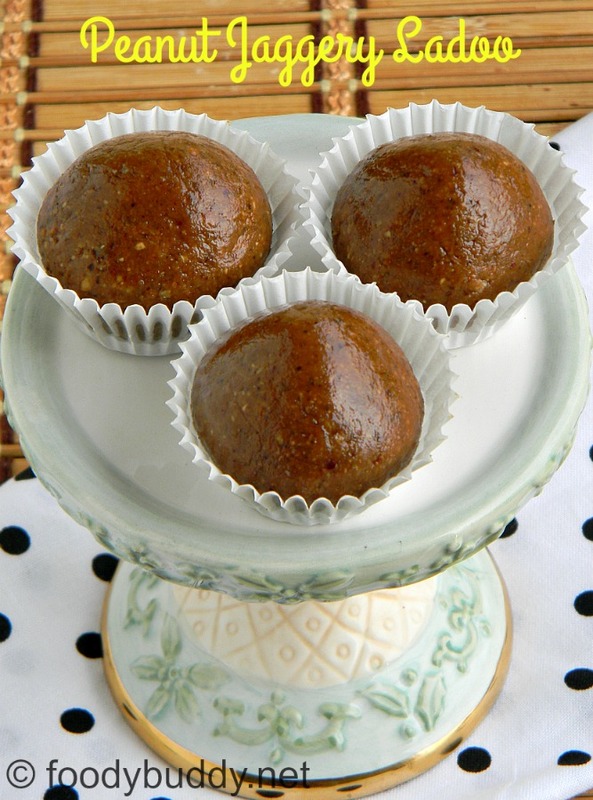 In this ladoo, jaggery adds a sweet note, cardamom for flavor, coconut and ghee for taste. Even a diabetic people can eat this ladoo in moderation as peanut are low in glycemic index. Foods with low glycemic index do not trigger a spike in blood glucose. Try this easy ladoo for diwali and let me know friends how it turned out for you. 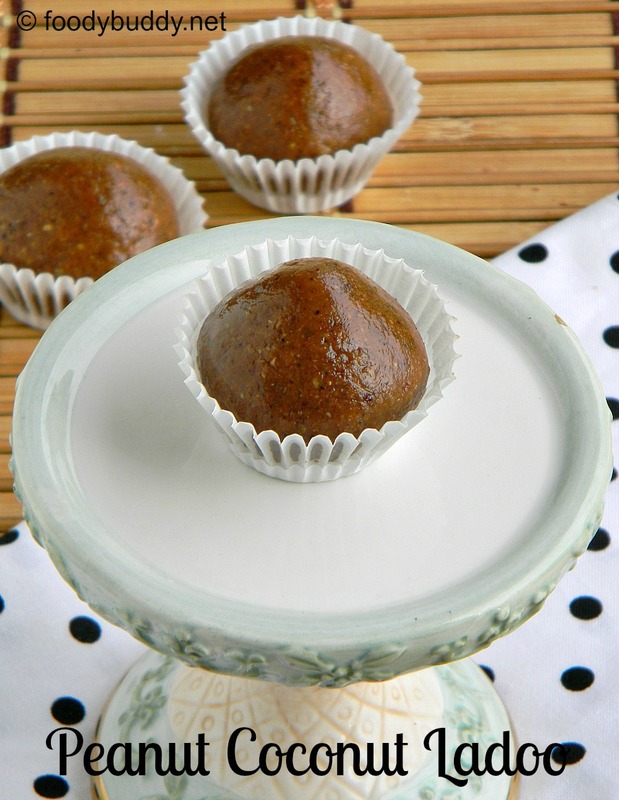 Easy Peanut Ladoo Recipe / Peanut Jaggery Laddu is a healthy delish that can be made very quickly with just 5 ingredients. You can make this ladoo for snacks for kids or festival occasions like diwali. In a mixie jar, add all the ingredients except ghee and grind everything together..
Heat a pan with little ghee, add the ground mixture, saute it for a 2 mins in a medium low flame and turn it off. Allow it cool for few mins. Make into a balls or any desired shape. 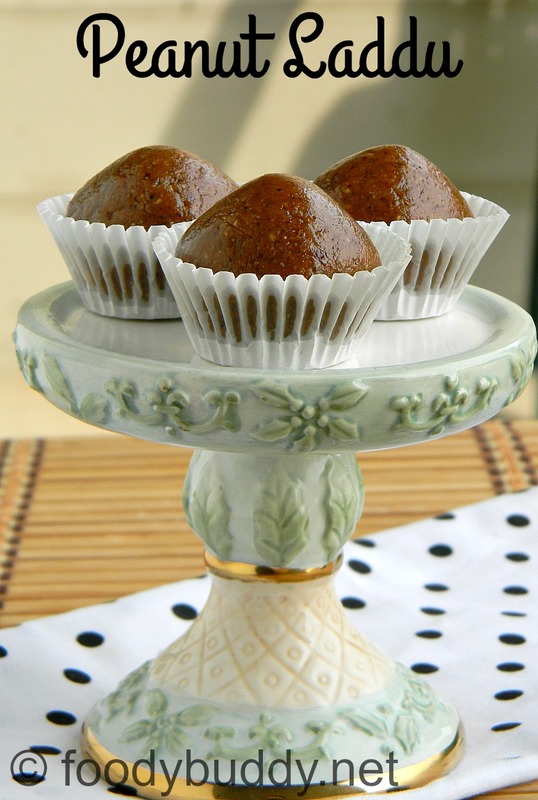 Delicious peanut jaggery ladoo is ready to serve. Here I used roasted peanuts, if you have raw peanuts, dry roast or oil roast it and then use. If you don't like jaggery taste, replace it with white sugar. For variations, you can use palm jaggery or brown sugar or honey or agave for sweetness. If you are allergic to coconut, avoid it. Adding a pinch of salt to enhance the sweet taste. You can also add any nuts to this ladoo. Since peanut is a nut, I didn't add any nuts. This entry was posted in diwali, festivals, Kids Corner, South Indian Recipes, Sweets and tagged diwali ladoo recipe, easy diwali sweets, ladoo recipe, peanut jaggery ladoo, peanut ladoo. I prefer such easy and not so fussy sweets this one will be my nxt to do one..
Peanut laddu with jaggery sounds so healthy.. Delicious laddus..